RYND closed in August 2016. I’ve left the review up for posterity. My normal rule is not to review restaurants that have just opened. It’s not fair to judge a place in the first month when it’s finding its feet, and most restaurants in Reading don’t have a soft launch to phase themselves in. One minute they’re all boarded up with people beavering away inside, the next they’re open and the front of house and the kitchen are learning to work together to offer something seamless. It must be a steep curve, doing that with all those hungry, demanding customers at tables expecting everything to be perfect from day one. My other rule is that I base my review on a single visit. In an ideal world it would be lovely to make multiple visits to a restaurant before writing a review, but life’s too short – especially if you want to read a new review every week. So instead they get one chance to impress and that’s it. Sometimes that can be a little unfair on restaurants: I’ve revisited some and found them to be better than I thought. Dolce Vita, for example, has constantly impressed me when I’ve gone back there and Bhel Puri House has become a reliable staple for a quick, interesting lunch. Sometimes it flatters places: Sushimania has never been anywhere near as good since as it was the time I went on duty. All of this makes RYND a difficult review to write. In the interests of full disclosure, I went there “off duty” shortly after it opened and really liked it. 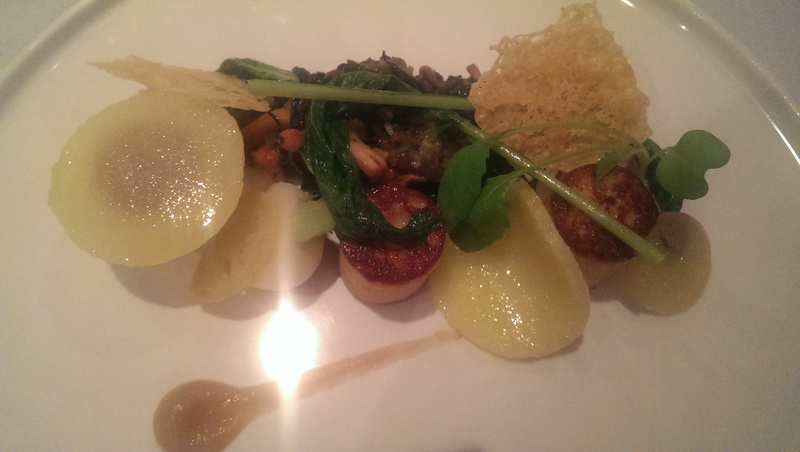 I thought the food was interesting and well done and the service was excellent. But going back, just over a month after it opened, was like going to a different restaurant. What changed? Well, the menu for a start. Sitting down I was presented with a different menu to the one I chose from on my previous visit – and, indeed, a different menu from the one on the website at the time of writing. The alterations were subtle but telling: no courgette fries any more, two of the burgers had come off the menu, one of the starters had been removed, you no longer have the option to order pulled pork as a main except as part of the upsold combo with chicken wings (odd, really: the menu boasts about how proud RYND is of its pulled pork but it’s not possible to order it on its own). The burgers that had been taken off were the basic options: a plain hamburger or a cheeseburger. The cheapest things on the old menu, as it happens. That leads to the second change on the menu: the prices. Everything has been hiked in the month since the restaurant opened, the starters by around a pound and the main courses by between two and three pounds. All the burgers are now over a tenner, although in fairness to RYND you pay about the same for a burger at their closest competitors, the Oakford or Handmade Burger. Even so, it just felt a little cynical. Perhaps the initial prices were soft launch prices and RYND just decided not to tell anybody. It wasn’t a brilliant first impression, but I put it to one side. After all, the prices weren’t necessarily unreasonable and RYND deserved to be judged on the food, the room and the service, just like any other restaurant. And the room, it has to be said, looks gorgeous. All that exposed brickwork and exposed light bulb filaments might be a trope that’s been done to death in London, Liverpool and Glasgow but in Reading it still makes a refreshing change to see somewhere so beautifully fitted out. It’s broken up nicely into lots of little sections with a long, atmospheric bar (when I went there were a row of very bearded chaps sitting at it, all check shirts and beanies, presumably having a craft beer and pretending to be in Williamsburg). The only drawback was the black banquette running round the room – it looked plush and comfy but was disturbingly like a church pew, with less give than Jimmy Carr and Gary Barlow put together. And the food? Well, the food is where RYND really fails to impress. 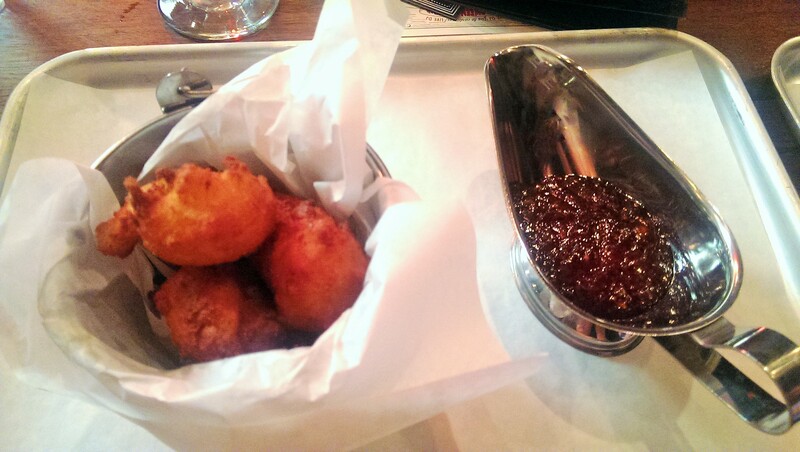 Of the starters, hush puppies were pleasant enough – deep fried corn fritters with enough texture to just about compensate for the lack of taste, still a little too crumbly for my liking but quite nice paired with sweet, spicy, slightly smoky chilli jam (“quite nice”, with hindsight, may well have been the high point of the meal). The other starter, the chilli bowl, was poor: a very small skillet of slightly anonymous chilli with a little heat but not enough, too much bounce and nothing interesting going on. I was hoping for something slow-cooked and complex, but this was miles from that (I’m no cook but I can make better chilli than this at home, and when I’m saying that there’s definitely a problem). Worse still was the little metal bucket of tortilla chips which came with it. Tortilla chips must be one of the cheapest things RYND serves up, and yet the bucket was barely two-thirds full. Again, it felt cynical. Pulled pork was possibly the crowning disappointment. Pulled pork should be dry and sticky with some smoke and spice, but this was just wet. Not moist, not even damp, but plain wet. It came in a sesame seed bun (with a needless wooden skewer: it was nowhere near tall enough to need one of those) drowned in mayonnaise. There was, I’m told, cheese and barbecue sauce and coleslaw in it but it didn’t feel like that at all. 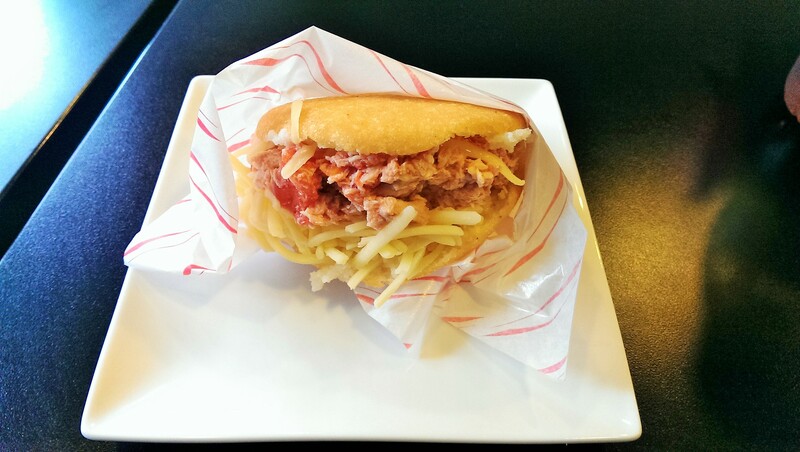 It didn’t even really feel like pork – with all that finely shredded mulch in mayonnaise I felt more like I was eating Reading’s most expensive tuna melt. It was so sloppy that eating it tidily was almost impossible – every bite forced more of it out of the other end on to the tray (of course it’s a tray, just like they’d have in Williamsburg). It wasn’t a sandwich, it wasn’t a burger, I’m not really sure what it was. A mess, I guess. 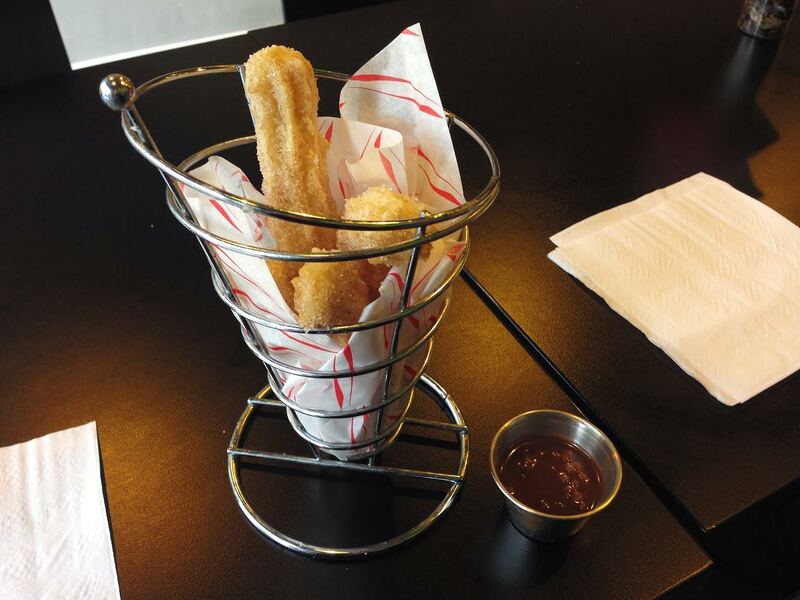 I did like the fries, though – flattened crinkle-cut slices like mutant McCoys, they were one of the better things I ate, especially dipped in the barbecue sauce. I think I’d probably describe the fries as quite nice. 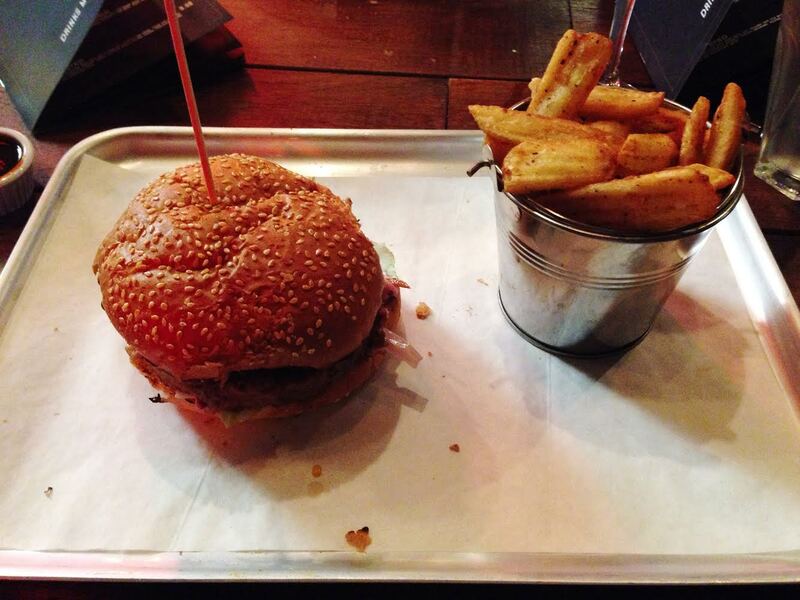 The “smokehouse burger” was a run of the mill beef patty, a little bouncy in places as the chilli was. It was meant to come with barbecue sauce, mature Cheddar and crispy fried onions, but the onions were missing, substituted with a thick dollop of red onion marmalade so sweet and sticky that you could easily confuse it with dessert. The mini-pail of sweet potato fries on the side (I asked for these instead because I wanted to try them out) did little to lift the overpowering sugariness. In their defence, they were really good – crisp and light where sweet potato can often be a tad soggy and limp. With a different burger they would be worth the swap but with this one it all felt a little cloying. It just didn’t feel like an eleven pound main course, and until recently it wouldn’t have been one. Service was pleasant and friendly: our waitress did have a crack at flogging us olives and recommending the most expensive main course, but that probably wouldn’t even have registered if I hadn’t already been irked by the menu so I won’t hold it against them. I should also mention the drinks – it was happy hour so I tried the spiced apple daiquiri which was pleasant but no more than that, and a 125ml glass of Portuguese red which was straightforward, uncomplicated and really easy to drink (hats off to RYND for offering small glasses of wine and pricing them fairly: many places don’t). The meal for two, two starters, two mains, those cocktails and a small glass of wine came to forty-six pounds, not including tip. Looking at the bill I saw the final piece of stealth margin maximisation – charged an extra pound for substituting sweet potato fries for standard fries, another thing the menu neglects to mention. As you can probably tell, RYND got my back up from the start. But being dispassionate about it and trying to forget my earlier, better visit (and wider menu. And better pricing. Hmm. Suddenly there seems to be quite a lot to try to forget) I still can’t recommend it. Judging it on its merits, if I wanted this kind of food Blue’s Smokehouse does it many times better (and a little bit cheaper). And if I wanted this kind of food and didn’t want to leave Reading, I think I’d go to the Oakford which offers more, better burgers, again slightly more attractively priced. But I suspect RYND will do perfectly well all the same – it’s a kind of food people want to eat at the moment, the kind of place people want to eat it in and I imagine hipsters will enjoy telling each other that the Oakford is so last year. Oh, one last thing: RYND is pronounced rynd as in quite nice rather than rynd as in cynical. But in reality it’s probably a bit of both. Probably the strangest moment in my meal at (to give it its full name) Shaun Dickens At The Boathouse happened quite early on. We were sitting in the bar with an aperitif having just finished what the waiting staff had described as “snacks”. Things were shaping up nicely. My fino sherry had that dry, almost salty tang that I love. The parmesan and paprika doughnut was unusual and delicious, as was the long thin rice cracker dotted with (surprisingly mild) wasabi and smoked mackerel. Then a waiter came over. And the Boathouse, although it may have been overlooked by Michelin recently, did win “Best Of Britain” at the Tatler Restaurant Awards earlier this year, so it’s obviously been noticed by someone. Anyway, this didn’t really bother me: after all, if the cooking’s good enough who cares if the chef’s name is emblazoned on the drinks coasters? He can have a passport photo on every page of the menu for all I care, so long as he sends me away evangelising about his food. The serving staff – uniformly bright, personable, knowledgeable about the menu and genuinely charming – stood out right from the off, possibly because of the surroundings: the Boathouse is a very beige room indeed. It’s a single big beige room packed with tables with beige nondescript chairs, beige walls lined with nondescript art (all riffs on Jackson Pollock) and with beige music playing in the background. Passenger, Coldplay, the list goes on… it was what Glastonbury would sound like if the lineup was picked by Simon Mayo. A short loop, too, because within two hours we were right back to the start of their playlist (the fact that I noticed this isn’t a good advertisement for the food). The bar, also part of that dining room, is cordoned off by a white, diaphanous curtain. It feels a bit like being in Princess Diana’s boudoir – which might be good news, I suppose, if that’s always been an ambition of yours. Normally at this point I would go into exhaustive detail about everything I ate. And there was a lot – what with “snacks”, the bread, the amuse bouche, the pre-dessert and everything else. But the problem is that it was all so competent and unexciting that it’s almost like trying to remember the details of a not very interesting dream on your way to work the next day. Everything was well executed, pretty and precise, but the wow factor I associate with cooking at this price point simply wasn’t there. Perhaps “fine dining” (does anyone really use that phrase without the protection of ironic inverted commas any more?) has had its day – certainly the fact that only a handful of other tables were occupied on a Friday night suggests there might be something in that. There were high points, but ironically many of them were the freebies: beer and onion seed bread, baked on the premises I’d guess, was stunning with a crunchy, almost flaky crust and a soft middle. The whipped caraway seed butter was good, but the simple salted butter was even better. I’m not sure I ate anything that quite lived up to that standard. The amuse bouche, actually, was a good indicator of the kind of meal we were going to have. A little sphere of what I think was chicken rillette with Jerusalem artichoke and sorrel oil was pleasant enough, if a bit bland and clammy, but the best thing about it was an intensely savoury crumb made from potato and chicken skin, like the powder at the bottom of a packet of pork scratchings. It was lovely, but it seemed like a lot of effort to go to for a tiny component of a tiny dish – misplaced effort, perhaps, when so much of the menu was crying out for a bit more flavour. Of the starters, pork with smoked haddock and chick peas was a misfire. The chick peas, chick pea puree, little cubes of smoked haddock and a sweet, sour curried aigre doux was absolutely gorgeous, but the cold cylinder of pressed pork in the middle was really unappealing, a star of the show far too easily upstaged. I guess I was hoping for a compact cube of perfectly cooked pork belly, but it wasn’t to be. 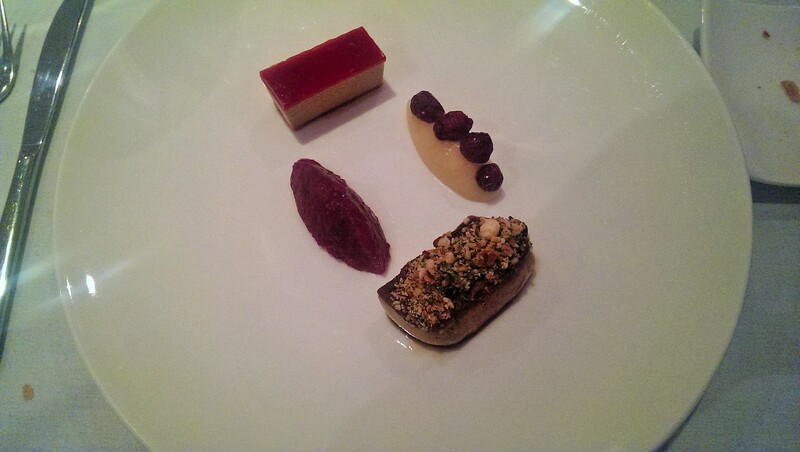 The other starter, foie gras served two different ways, was really tasty – although the composite parts didn’t quite gel. The foie itself, served mi cuit, was nicely done with what I think were crumbled pistachios on top. 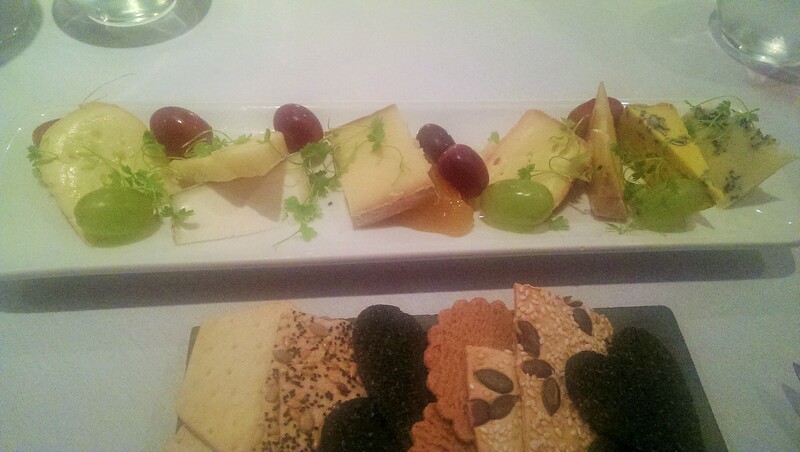 There was also a separate foie gras terrine, looking like a little savoury cheesecake, which I thought was rather witty. As for the other things on the plate, the quince puree was nice and the cranberry chutney was a little too tart. This all came with a slice of toasted brioche, served separately so it didn’t interfere with all the prettiness on the plate, like an ugly relative kept out of wedding photos. Overall it was a bit quixotic, if beautiful to look at, but if you like foie gras (as I do) then it wasn’t going to disappoint. 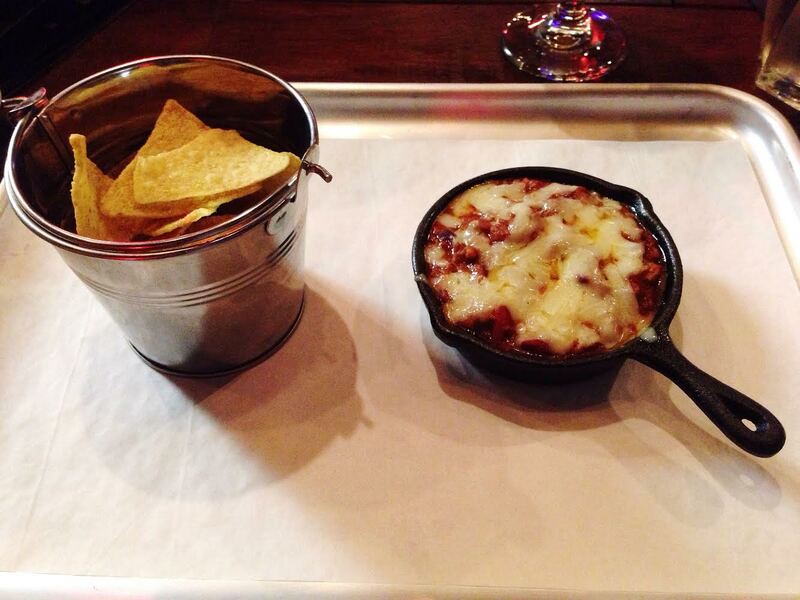 Probably the best value dish on the menu, too. Mains continued the trend of style over substance. 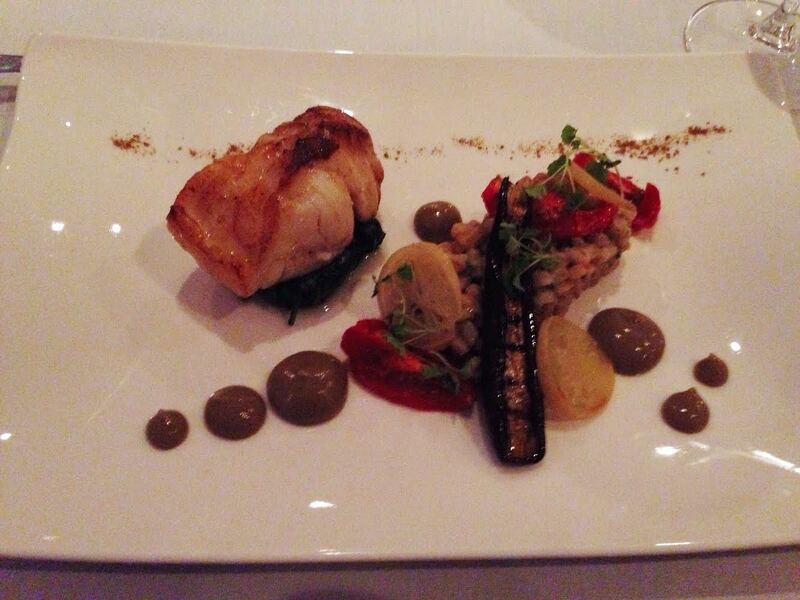 Monkfish with farro, preserved lemon and charred aubergine was similarly frustrating. The farro was like a pearl barley risotto and very nice it was too. The charred aubergine was, well, a single piece of charred aubergine. And the monkfish? Cooked absolutely spot on, so firm, almost like sashimi in texture, a big generous piece (resting on a totally pointless bed of spinach – why do restaurants do this?) but unseasoned and not really going at all with the farro. Eating that dish was a bit like listening to an epic fiddly guitar solo: there’s clearly lots of skill involved, but the only person really enjoying themselves is the person playing the guitar. By this stage, in the meal as in this review, I was pretty much going on because I felt I should rather than because I much wanted to. Also, I was still hungry, because three gnocchi isn’t going to bring on a Mister Creosote moment for anyone. Things didn’t improve. The cheeseboard should have been a high point – eight carefully selected British cheeses, including many I’ve not heard of before. And yet even these were pastel shades of cheese rather than bright primary colours; only the Admiral Collingwood (a punchy number washed in Newcastle Brown) and the Dunsyre Blue stood out. Eight rather stingy pieces to share cost eighteen pounds, and I couldn’t help but compare it with the cheeseboard just down the road at the Three Tuns, where for half the price you get three far more sensibly sized pieces of well selected cheese: a soft, a hard and a blue, all you really need. Things rallied slightly for the desserts. A pre-dessert of maple espuma with poached pear, thyme, thyme oil and candied nuts was probably the tastiest, cleverest thing I ate all evening. But by then knowing the kitchen could produce something like that just made me even more frustrated about what had gone before. Finally, the white chocolate parfait, topped with torched orange, studded with sweet crumbly pieces of tablet and served with a very fine salt caramel ice cream did its best to redeem matters, but by then it was too late. I should also mention drinks, because they were all good, from that initial sherry to the Sauternes with the foie gras and the Tokaji with the dessert. The red, a Uruguayan Petit Verdot, was especially good – dark and inky with a rich whiff of pencil shavings about it. If they ran a wine bar, I’d definitely go (as long as they sorted out that infernal soundtrack), but as a restaurant my feelings are far more mixed. A lot of that comes down to the bill: one hundred and eighty-three pounds, not including tip. Obviously you could pay a lot less if you missed out the cheese, the aperitifs and the dessert wines but this is never going to be a cheap meal. That’s not the problem. The problem is that this is cerebral, clinical cooking, and for that money I wanted a lot more. The best meal I’ve ever had was in a little restaurant in Barcelona which didn’t have a Michelin star but has picked one up since. I can still remember several of the things I ate that night, even though it was seven years ago. And for me, at the very top end of the spectrum that’s what I’m looking for when I go to a restaurant: flavours and combinations I’ll never forget, dishes I would rave about to friends, contenders for that hypothetical death row feast. Did the Boathouse come close to that? Not remotely. I might be able to forgive their food for being small, I could even overlook it being expensive, but on the train home I thought about whether I would sing the praises of anything I’d eaten and realised that none of it inspired any passion. The next day I had hot buttered toast with a nice thick layer of Marmite. Unpretentious, powerful, delicious: it was the best thing I ate all weekend. Chennai Dosa closed in June 2018. I’ve left the review up for posterity. The same people apparently own Vel, which has also been reviewed here. Chennai Dosa has been on my list of places to review since the very beginning and it’s probably remiss that it’s taken me so long to get there. It seems to fall between countless stools in the Reading food scene; too big for lunch and too small for dinner, not expensive but not mega cheap, right in the centre but away from the main streets. 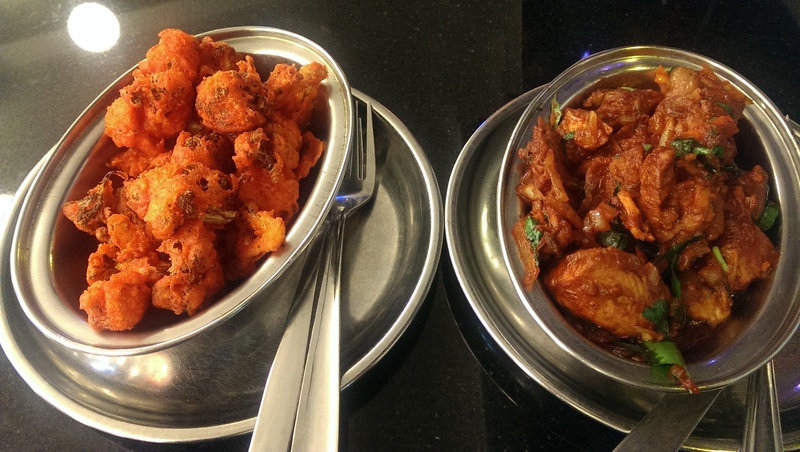 Even so, it has carved out quite a niche by offering fast-ish food from south India, setting it apart from holy trinity of curry, rice and naan offered at Reading’s other – more Anglicised – Indian restaurants. It would appear to be good at it, because visiting early on a week night I was pleased to see that it was busy; excellent news, because there are few things more uncomfortable than reviewing an empty restaurant (in fact, if anything, it was even busier when I left). The menu here is overwhelming for newcomers: nearly 150 dishes, a quite head-scratching amount. I was certain that I would have the dosa, as it would be churlish not to, but what else could I try to get a decent sample? Starting with the “Gobi 65” turned out to be one of my better ideas. Small florets of broccoli (not the cauliflower advertised on the menu but I’ll overlook that on this occasion) marinated in spices and then fried were just gorgeous – light and spicy without being overly hot. They were the kind of fun vegetables that could almost persuade kids to eat their greens (and a lot more tasteful than their close relative, Eiffel 65 – an earworm I had for the rest of the evening thanks to Chennai Dosa). The other starter of chicken varuval was equally successful, if quite substantial. Large pieces of chicken cooked with south Indian spices in a delicious, dry, deep red sauce, with peppers, onions and curry leaves. It had a depth of flavour – and a slow, building heat – that I would struggle to adequately describe but which would definitely made me order it again. The chicken, sometimes a bit dry in Indian restaurants, was beautifully soft and the sauce was richer than Donald Trump (and infinitely more palatable). Hearty food, this – so hearty than it could easily have passed itself off as a main course. Speaking of the mains, they started to turn up before we’d finished off our starters, which I found irksome. I guess as a relatively informal dining experience Chennai Dosa takes the same approach as Wagamama in that your dishes arrive when they feel like it, but I wasn’t expecting that and it’s always been a bugbear of mine. Besides, why divide your menu into starters and mains if you’re going to bring them all at roughly the same time? That, coupled with the erratic service, meant that the mains arrived before one of the drinks – a pint of Kingfisher we had to ask for a total of four times. The irony: this must be the only Indian meal I’ve ever had in Reading where getting the waiter to bring beer to the table has proved difficult. 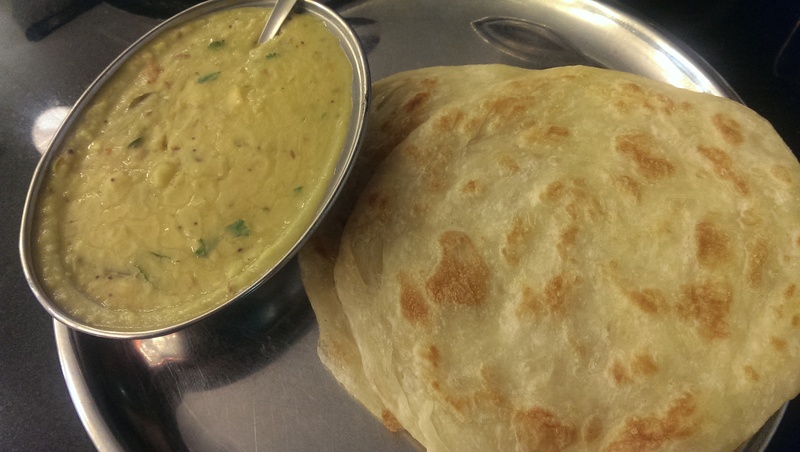 Of the mains, dal with paratha was pleasant verging on dull. The dal had curry leaves, small chunks of tomato and was speckled with nigella seeds and was tasty enough when scooped with a torn piece of buttery paratha but it lacked the richness and complexity of the chicken or the spice of the gobi. I guess I’m used to the intense, rich dal of places like House Of Flavours which is strong enough to stand as the main attraction, but this felt like a side dish pure and simple; my mistake, perhaps, rather than the kitchen’s. The dosa, on the other hand, was delicious. What arrived at the table was a shiny stainless steel prison tray with a number of sauces, chutneys, sambar etc. 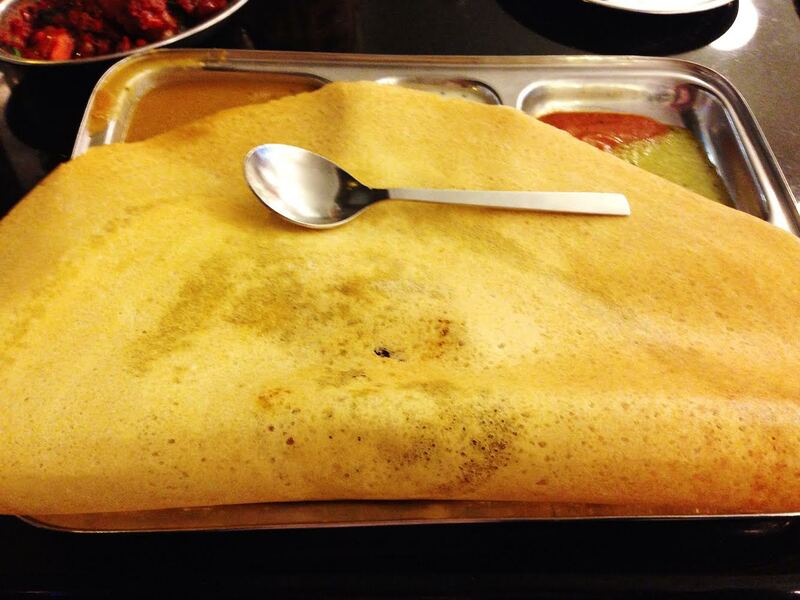 on one side and a huge – and I mean huge – folded over crepe filled with curry on the other. The texture of the dosa was a thing of wonder – slightly crisp on the outside while being soft and pliable in the middle (a bit like the first pancake on Shrove Tuesday that the chef sneakily eats in the name of quality control). The filling was a huge helping of potato masala with an equally generous portion of spiced chicken on top. This is definitely the thing to order, I reckon, and everything about it was marvellous. The masala was a mixture of firm chunks of potato and gooey, comforting mash. The chicken was full of spices – cardamom, star anise and cinnamon all ended up on the side at the end – and again, the texture was exactly right. Add to that the part-crispy, part-spongy dosa to grab, scoop and dip and the range of sauces to mix things up with and you have something that’s part meal, part edible adventure playground. I loved it. Despite feeling quite full I just cannot resist gulab jamun so dessert was inevitably on the cards. They’re a known quantity for me by now and Chennai Dosa’s were nice but unexceptional, delicious and unsurprising: warm, squidgy and with more syrup than, erm, Donald Trump (I really don’t know why he keeps cropping up. Sorry about that.) 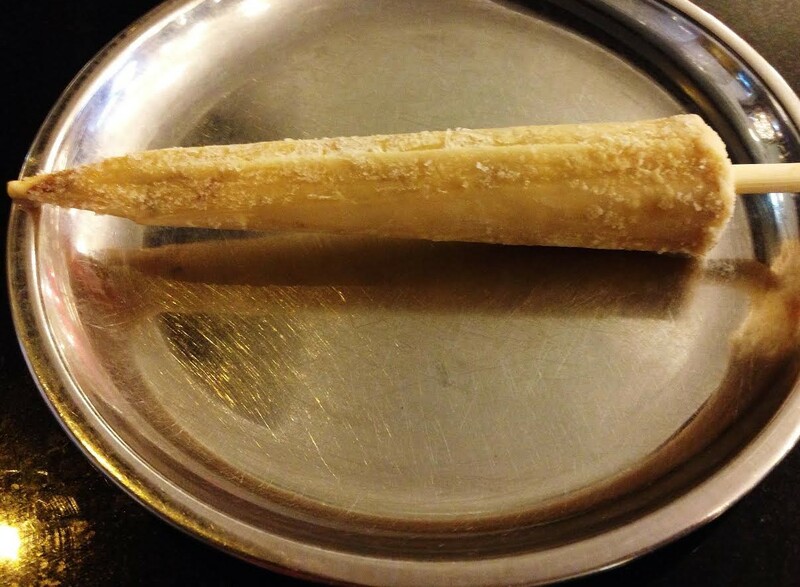 They were bettered though, by the honey and rose kulfi which was like a Mini Milk from heaven. If you can imagine a super creamy ice cream lollipop with subtle, grown-up honey and rose flavours then you’ll have a pretty good idea what this tasted like. At £2.25 I had half a mind to order another and eat it on the way home. To drink we had a couple of disappointing mango lassis, a pint of Kingfisher – eventually – and a huge glass of red wine (unintentionally huge but I did drink it all) that came in a glass so chalky from the dishwasher that you could have written on a blackboard with it. Service was adequate but forgetful, though to be fair Chennai Dosa is as close to a canteen as it is a restaurant, with a snappy turnaround of diners and tables rarely occupied for more than 45 minutes at a time. The bill for three courses with drinks for two was thirty six pounds. I would say it was without tip but it seems there is no concept of tip here – the bill has to be paid in cash at the till and there’s no tip jar, let alone the idea of the “optional” service charge. As so often, I was so keen to try everything Chennai Dosa had to offer that I’m pretty sure my experience wasn’t typical. I don’t think this is a three course starter, main, dessert kind of a place: it’s somewhere you can grab a quick tasty lunch or a quick tasty dinner and then be on your way. But for that it’s pretty close to unimprovable. The dosa in particular, at less than a fiver, is just perfect and made me think twice about spending close to that at countless other lunch places in town. The worst thing about eating here – apart for the interminable wait for drinks – was also the best incentive to come back: seeing all manner of different dishes arriving at other tables and wondering what they were. Next time I might pluck up the courage to go over and ask – right after I’ve finished some more of that Gobi 65. And got rid of that earworm, with mind bleach if necessary. Faith Kitchen lost its licence in April 2016 and is now closed. I’ve left the review up for posterity. I went along to Faith Kitchen really not knowing what to expect. My knowledge of African food before the visit – I’m not ashamed to say this – was primarily based on Googling words from the menu on the number 17 bus on my way there. I also had no idea what it looked like: in the big hurrah of the restaurant opening a couple of months ago, all the photos were of the ribbon cutting outside so it was impossible to see the interior without turning up to have a look. The restaurant, on a school night, was eerily empty. We shuffled in and picked a well lit table in anticipation of taking photos, although if anything it was impossible to sit somewhere that wasn’t brightly lit. I’ve been in restaurants before where I’m at the only occupied table, but even those haven’t felt quite as empty as Faith Kitchen did (maybe it was the lack of any background music). The tables are nicely spaced and the chairs had bright golden seat covers. The overall effect was of being the only guests at a wedding reception, an odd feeling if ever there was one. Also, the room has a gold dado rail – you don’t see one of those every day, or indeed ever. The menu is intimidatingly big and unwieldy. It wasn’t clear what exactly were starters, what were mains, what were side dishes and so forth, something not helped by the confusing pricing (more on that later). Some of it is split by region, some isn’t, for reasons which aren’t made clear. I’m sure if you know Nigerian cuisine very well (and think “swallow food” is a particular dish rather than a very basic instruction) this is all absolutely fine, but as a newcomer to it I felt pretty bewildered. The other hazard with a huge menu is the risk that the kitchen either can’t do it all or can’t do it all well. In this case, it was the former, so some of that bus research rather went to waste. So for instance, I fancied puff puffs (a sort of Nigerian doughnut) but they didn’t have them so we settled for chin chins instead. For the uninitiated – which included me until this meal – they’re small sweet cubes of dense hard biscuit flavoured with nutmeg and, I’d guess, a little cinnamon. They looked disconcertingly like dog biscuits but tasted quite pleasant, although they felt like something you’d have with a cup of tea rather than to get you in the mood for your main course. We munched our way through half a ramekin of these but in the end there was just too many of them to eat and they didn’t go with anything else. 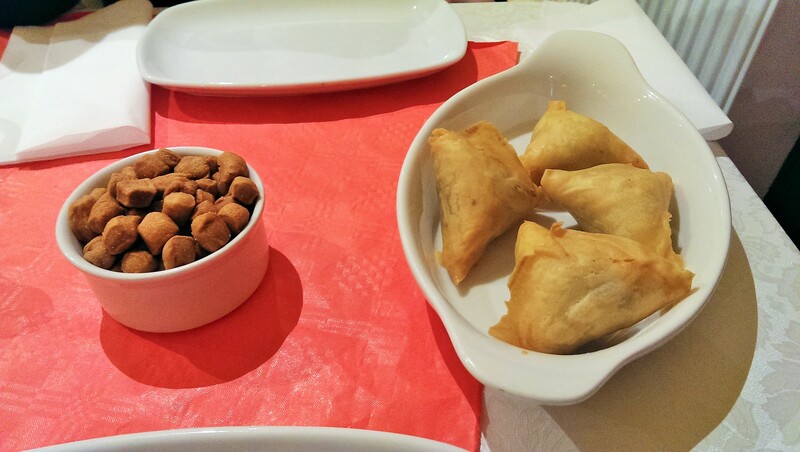 Meat samosas, on the other hand, were top notch: triangles of very thin filo pastry filled with minced lamb and onion. Everything worked perfectly – the meat was coarse, tasty and deeply peppery and the filo added just the right amount of crispy contrast. The other starter we ordered was chicken suya, which – according to Wikipedia – are skewers of chicken with a fiery, nutty sauce. Another menu problem: the waitress wasn’t sure if they could cook this but after a quick conflab with another member of staff we were assured it would be fine. What turned up was neither nutty nor skewered. Instead, it was a wooden board with about six small pieces of chicken on the bone, superbly spiced and fried with crispy skin that made roast chicken skin look pretty limp in comparison. It came served with fresh tomato and red onion which we mostly ignored in favour of giving the chicken our undivided attention (plus raw onion has never been high on my list of favourite things). Besides, getting it off the bone was more difficult than I’d expected. 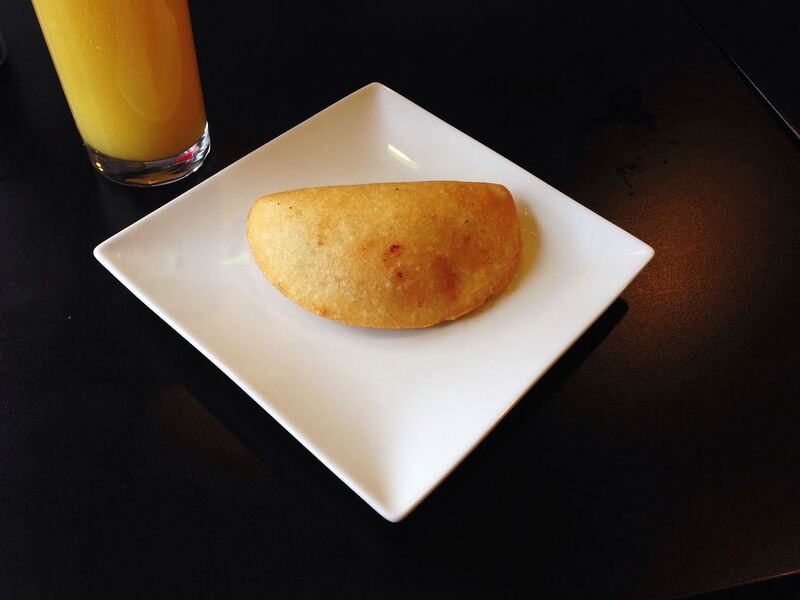 Again, the flavour was gorgeous – a great combination of salt and spice and texture – so much so that dividing it all up almost caused a diplomatic incident. The mains were equally confusing, to say the least. 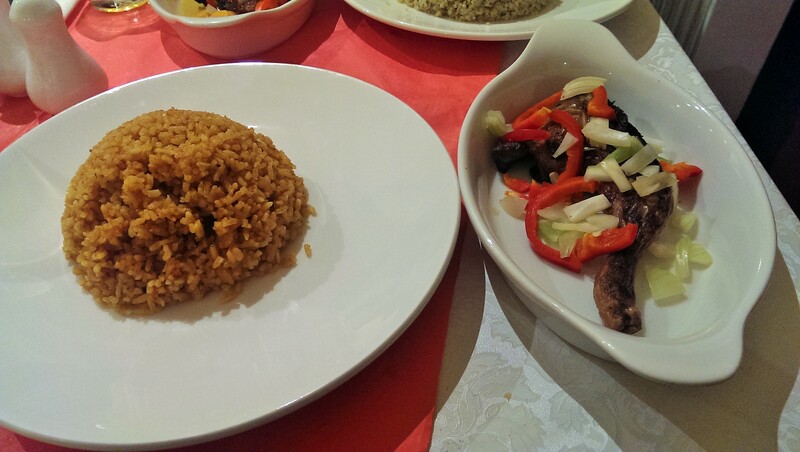 Jollof rice with chicken seemed to be another signature dish from my limited research and I’d say it summed up my experience of the restaurant as a whole: some great flavours coupled with very erratic execution. I got a mound of brick red rice on a plate and, on a separate dish, a chicken leg, skin on, strewn with peppers and onion. The rice itself was very good; I don’t know how they managed to infuse it with so much savoury tomato but it was tasty and interesting almost in equal measure. The chicken, what there was of it, was also good, if rather close to the starter I’d already eaten. It was, however, one of the scrawnier chicken legs I’ve seen and considerably less meat than I was expecting. Once stripped from the bone it formed a much smaller heap next to the rice. The peppers were sweet and crispy but the onion, in wan chunks, was best left. Did the whole thing add up to a dish? Well, it didn’t quite feel like it, and the lack of any sauce or moisture either in the rice or the chicken made it a pretty dry experience. The other main was grilled chicken with homemade Faith Kitchen sauce. 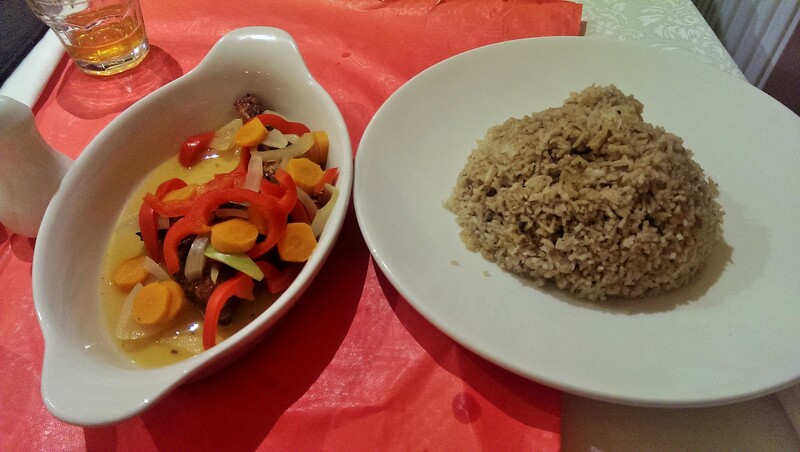 The chicken here was pretty much the same as with the jollof rice – spindly, dry and tasty but thin on the ground. I’m not sure what the home made Faith Kitchen sauce was meant to be, there was a little of something that looked like sauce in the dish but it was watery and flavourless (the waitress also brought a bottle of soy and a bottle of chilli sauce to the table which didn’t feel like a vote of confidence). The menu doesn’t explain whether the chicken came with anything, so after asking several questions I also ordered some pilau rice. This was really tasty – spicy but not overly hot with flavours of, I think, cinnamon, cumin, fresh ginger and chilli plus a few chunks of potato and even a couple of pieces of chicken. This made me feel like I’d ordered two things which weren’t necessarily meant to go together. Again, the whole thing was tasty enough, but very dry. Where was the moisture in this dish meant to come from? And why so little chicken? Now, I deliberately haven’t talked about this until now and I don’t normally discuss pricing in detail but in this instance I really have to. The pricing at Faith Kitchen is crazy. It appears to bear no relation to the size or cost of any of the ingredients. So for example, the four delicious samosas came to £2.50. Four samosas. Two pounds fifty. It could easily have been half the size or twice the price. 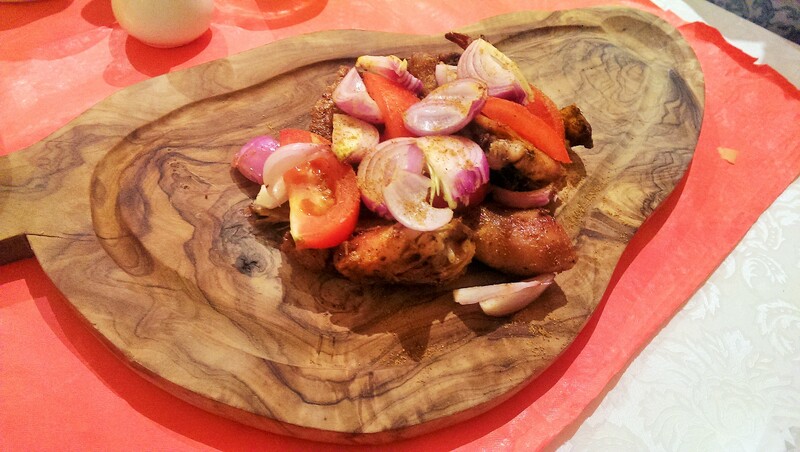 The chicken suya, on the other hand, was £9 for six thumb-sized pieces of chicken on the bone and some raw vegetables. Things get even more random when we talk about the mains. Jollof rice with chicken is £8 – that’s eight pounds for a chicken leg and some rice. You could argue about whether that represents good value, but then you get on to the grilled chicken with sauce: that was £9, and I was charged £5 on the side for the pilau rice. That means two equally baffling things: either I paid £9 for a chicken leg, or I paid £14 for a chicken leg with rice. Either way, if you think about how much chicken you’d get for £9 elsewhere in Reading, or the kind of main course you can buy for £14, it doesn’t bode well for Faith Kitchen. Even the drinks were bizarrely priced. I had a Ghanaian spiced gin – because I like to experiment – and a 200ml bottle of that cost £3.50. Yes, 200ml for £3.50. That means I got a whole miniature bottle of gin – four times the size of the bottle you might get on an aeroplane – for less than the price of a G&T in a pub. It just makes no sense. Going through my bill at the end – it came to thirty-five pounds, not including tip – I couldn’t help wondering if the cost of the dishes had been chosen at random. We didn’t have dessert – the rice left us too full and, thinking back to the chin chins, I did rather feel like I’d already eaten it anyway. Service was a similarly mixed bag. Our waitress was absolutely lovely throughout but I got the impression that she didn’t have any prior experience in the service industry; despite the restaurant being almost empty it could be hard to get her attention and dishes were brought over piecemeal leaving us to wait for her to come back with the cutlery. The tables aren’t laid and the cutlery was delivered wrapped in a paper napkin which reminded me of eating in a cafe, not a restaurant. Faith Kitchen illustrates – better than anywhere else I can think of – the gulf between being a cook and a restaurateur. Most of what I ate tasted really good, and when it didn’t quite hit those high notes it at least tasted unusual enough that I enjoyed it anyway. But there’s so much more to running a restaurant than that. You have to create a space with ambience where people want to spend an evening. You have to put together a menu that invites diners in rather than scares them off. You have to understand portion size, cost and quality and juggle all of those factors so that everybody wins, you included. It may be that Faith Kitchen will do quite nicely catering for people who already know and love Nigerian food and are devastated that they can’t find it in Reading, and if so all well and good. I really hope they do well. But if they want to have a wider appeal than that and popularise this under-represented cuisine, I think they need to look at their menu, their pricing, their portions and the whole experience they’re offering. The food is lovely, really it is, but you need more than food – and faith – to run a restaurant.